First Line: "I breath in." 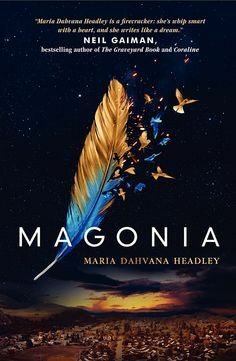 Review: Talk about an imaginative world, Magonia had ships sailing in the skies, bird people...literally, Magonians who have blue skin, Sky sharks, Squallwhales and Heartbirds who live in a little door that is part of the Magonians bodies along with a whole bunch of other weird but really unique beings. I really enjoyed the weirdness and uniqueness although at times there were a few things I had a hard time picturing fully in my head. Aza has been sick since she can remember, she has a hard time breathing air, come to find out she is not human but of an entirely different race of people who live in the sky called Magonians. I liked Aza for the most part even though all this craziness was going on around her I didn't find her to be much of a complex character which is what I look for when reading but I did find myself more into her character towards the end of the book. Also there was Jason Aza's best friend and he has chapters in his point of view as well, nothing really stood out about him I've read many boys who were like Jason in several books. I did however like how dedicated he was with his friendship to Aza. I felt some chapters were better than others. At some points I was bored and others I was turning the pages as fast as I could. Overall though I did like the concept of Magonia and I felt I cared enough about the characters towards the ending to where I do want to pick up the next book when it comes out especially with that open ended ending and I have so many questions that I need answers to. ~"Maybe every planet in this solar system is discarded by giant hands. Each star a crumpled ball of paper, a love letter lit on fire, a smoldering bit of cigarette ash."